Description: A front, overhead view of the number two YF-12A (60-6935) on the ramp at the NASA Flight Research Center (now NASA Dryden), Edwards, California. Notice how the chines end abruptly, just aft of the nose radome. 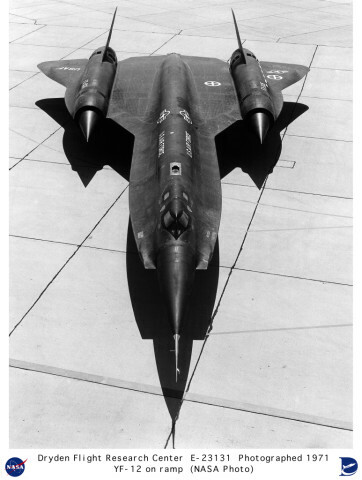 The aircraft was originally designed as an interceptor. The large radome housed a radar for the Hughes ASG-18 missile fire control system.